His daughter and political heir Maryam is similarly imprisoned, while his wife Kulsoom is fighting cancer thousands of miles away in London. Sharif himself is also in frail health. And the great gamble he took in returning to Pakistan days ahead of the July 25 election has failed to galvanise support. Instead, Khan is set to take the oath as prime minister and usher in a "New Pakistan" on August 18. The opposition is protesting against alleged electoral fraud. Supporters say Pakistanis will remember that Sharif and daughter Maryam were in London with his ailing wife when their jail sentences were handed down. They chose to return to Pakistan, where they were arrested as soon as they landed. But the hoped-for surge of support for his party -- led into the campaign by his less charismatic brother, Shahbaz -- has not materialised. Once ubiquitous in the media, Sharif has issued no public statement in weeks. "They wanted to sell this politically. But the gamble didn´t pay off," analyst Fahd Husain said. Sharif is "being punished only for one reason, and that reason is that he is not bowing his head" , Mushahidullah Khan, a former PML-N minister, told AFP. Imran Khan, who first instigated the corruption charges against Sharif, has told AFP the PML-N´s claims are "conspiracy theories" and a "smokescreen". The court decision ousting Sharif may have been controversial, but repeated accusations over decades mean he is widely perceived as corrupt. Critics dismiss him as a leader who stole billions from Pakistan, giving Khan´s vow to end graft an extra edge. "(Sharif) is fighting for civilian supremacy. If he is going to jail, it is worth giving that sacrifice," says the PML-N´s Zubair. Sharif has been down and out before. Expelled from power in 1993 on suspicion of corruption, he won the 1997 election, only to be ousted and exiled after a coup in 1999. He returned in 2007, and took power once more in 2013. Zubair said he will not fight for a fourth term. Now, it is his political legacy at stake. Saving that might not be up to him. "If (Imran Khan´s party) does well, Nawaz Sharif´s narrative will be diluted," said the analyst Husain. The PML-N has criticised the conditions of Sharif´s detention. Sharif, who suffers from high blood pressure, was briefly hospitalised in late July. "He looks far better than the first time," Zubair, who visits Sharif regularly, told AFP. 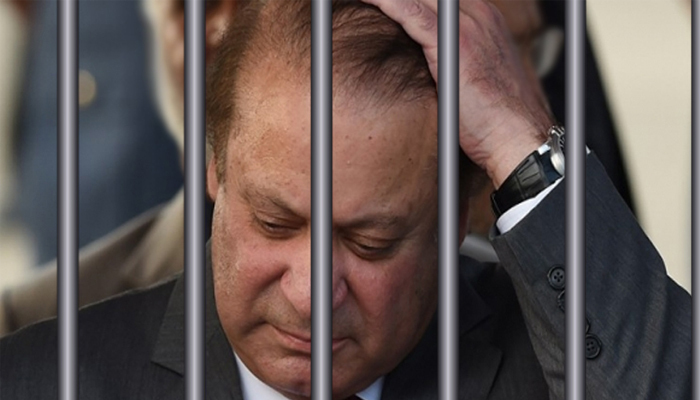 The ex-prime minister is "not in the worst possible cell", and even has a television with three channels -- state-run PTV, a weather channel and a sports channel. His fate has divided once-fervent supporters. Kashan Arshid, a former party youth leader in Rawalpindi, is unwilling to write Sharif off. "It´s the third time he´s suffered. Each time ... people say he is finished," Arshid said. "But every time he comes back, stronger. The lion will roar again."